… to brighten up such a dreary, miserable, wet (i could go on) day. 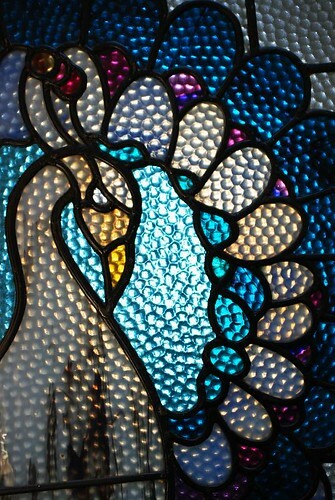 This is a stained glass peacock who’s pride of place is our bathroom door. It’s almost a hundred years old and used to be on a big plate window that was a shopfront here on the main street. Fearing the window might be accidentally broken, they split up the panels and several pieces are in other homes. 🙂 How’s that for feel good? if you break it, then you have to go window shopping!